Taste test: Back in the '80s, Eagle Snacks was famous for things like peanuts and pretzels, and you'd usually find them on airplanes. Owned by Anheuser-Busch back then, they were pretty good snacks. 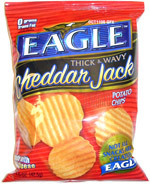 So imagine my surprise when I discovered that Eagle Snacks is back and they're in the potato chip business. The brand is now owned by Procter & Gamble Co., used under license by Reserve Brands LLC. Before I even opened the bag, I got a little sticker shock — one 1.5 oz. bag of these chips contained 240 calories and 17g of fat, so eating one of these bags is almost like half a meal. The chips themselves were thick cut and wide rippled (think Wavy Lay's). There was lot of orange cheese powder on each chip, so have a napkin handy. The powder gave the chips a lot of cheese flavor, as they definitely didn't skimp on creating a cheese-flavored potato chip. The wavy nature of the chip allowed the powder to settle nicely on the chip as well. Overall these were good chips. Let's hope that the Eagle brand continues to produce fine quality snacks. Smell test: Smells like potato chips, no heavy cheese or cheddar aroma. 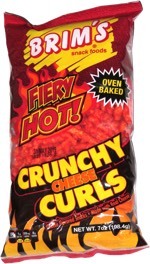 This snack was discovered by Keith at Network World vending machine, Southborough, Massachusetts. Review published .